I started using watercolours eight years ago. I went on an expedition cruise to Antarctica, and decided to have a crack at not just landscape drawing but watercolours. I picked up a Winsor & Newton 24 half pan travel set quite cheaply and took that with me. Although I wasn’t confident enough to take the paints out on any of our landings I did use them on the ship in my cabin. I still use Winsor & Newton, particularly the Cotman series. 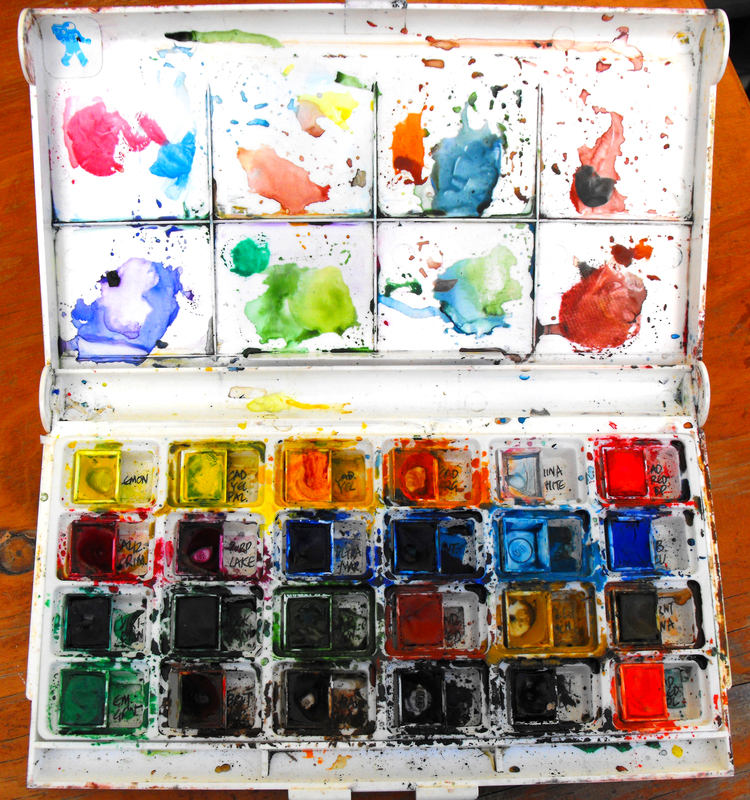 I use both half pans (travelling/en plein air) and 8ml tubes (for larger paintings). However, if I am painting a big picture, I like using my half pans for the smaller detailed areas as you don’t waste as much paint. One thing I do like about W&N half pans is that the paints look like the colours when they’re wet. I bought a small Daler-Rowney set, and the cyan-cerulean blue looked like a navy blue, which looked like a deep red colour, which looked like a dark green. So sitting next to each other int the palette I couldn’t tell one from the other. My brushes I’m not that fussy with. 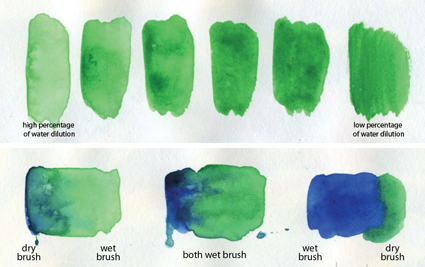 I use a mixture of … as well as a water brush pen when I’m sketching in museums or cafes etc. I’m pretty terrible looking after my brushes, so the checklist for me is – it’s affordable, the right shape and feel. Any other attributes a brush has I couldn’t tell you. Paperwise again I don’t have any particular favourites. I do opt for a 100% recycled or an unbleached rough-medium paper. As much as I like sketchbooks now, I still prefer to paint on large format paper, so will always prefer A4 to A3 watercolour pads. Like all people when they start out with watercolours there is that feeling of not knowing how to use them properly or how to get the best out of them. In my opinion there is no right or wrong way. Okay, there is technically, otherwise loads of artists wouldn’t be selling books on how to use watercolour, but I have seen so many different styles and techniques with this medium and they’re all damn funky that my theory is to just go for it and explore for yourself. say this because when you’re using them for the first time you tend to add more water than pigment and your paper looks like an aerial shot of the Lakes District. Top panel shows different saturations of water with the same colour. Bottom panel shows two colour blends with varied water saturation. 1. Experiment first: On a spare piece of paper try adding different amounts of water to your colours so you can not only see the difference in tonal qualities, but so you can also “feel” the wetness of your brush. The more you use watercolours the more you realise it is about the ratio of paint pigment and water retention in your brush, and it is something that you feel instinctively. For those of you who like baking it’s like icing a cake. Sometimes you need to wet a knife to help spread the icing evenly over a cake. Depending on the density of the icing if your knife is too wet it spreads the icing too far and waters it down, or not enough water wont spread it at all. The only way you can judge it is by sight and by touch. I don’t mean you stick your finger in the icing (although that is a lot of fun), but you can sense when it is too wet or needs a bit more water, and the same applies to watercolour paints. 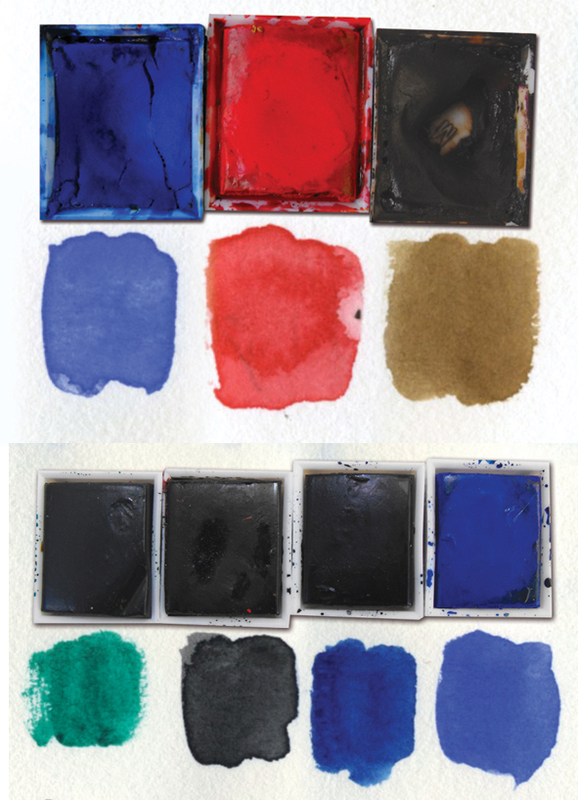 iServiette: useful in absorbing excess water in your brush or reigning in too much colour on your paper. 2. Save your serviettes: If you do have a tendency to add too much water to your brush or it blobs out too much on your paper keep a serviette/napkin next to your work. If your brush is too wet from constantly dipping into a water jar, press it into a paper towel and let it absorb the extra moisture. Plus, if you have laid your colour down and it is too wet and you want to start again – dip the corner of a serviette into the area you want to fix up and it will absorb the paint. 3. 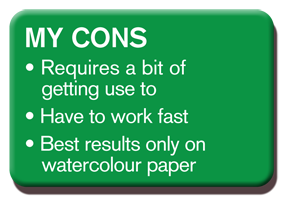 Don’t get brush lazy: Watercolours are such a fast applied medium it can be quite easy to end up working with the same brush for everything. For example, if I’m painting a tree I will use a medium to thick brush to paint in the trunk and the breadth of the greenery, but if I want to add a bit of detail, say, the leaves on the ground, or grass growing near the tree roots, I can get lazy and use the same brush. It’s not wrong, but if I had used a smaller brush having the two varying thicknesses would give the picture a bit more depth and contrast. I find I have two styles of watercolour. One is a very expressive spontaneous style, and the other is a tighter, detailed style. The former is more natural to me, but the latter does challenge me more. This more conservative style is not something I like to do all the time as I admittedly have a short attention span, but one subject matter I enjoy painting in this style is Antarctica. It’s a very special place for me, and feel incredibly privileged to have travelled there. It’s so overwhelming on a macro and micro level that I guess when I paint it I enjoy getting lost in all its detail. 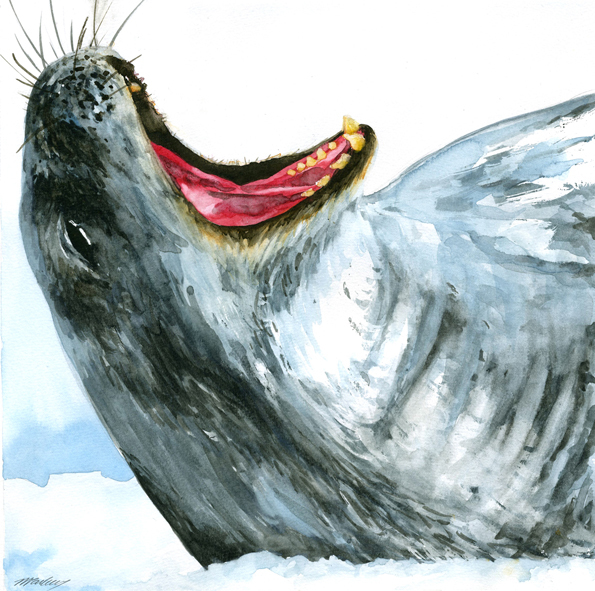 I am attempting a huge labour of love – an illustrated book on Antarctica. Sadly it is not a priority at the moment, but I have shown the first stages below. The Southern Ocean: image on the left is the first stage after removing masking fluid; second image shows the addition of the birds and ocean spray. 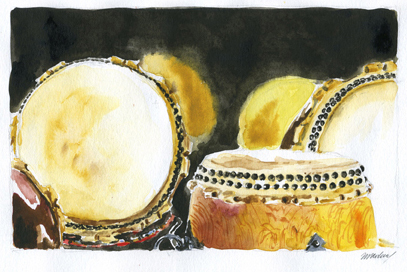 Using watercolours and indian ink in a painterly style. Over the last two years I have been taking my watercolours to most of my Sydney Sketch Club meetups and I started to use them in a way I felt was more of a conditioned style of painting rather than a way I wanted to use them. How do I explain this…? I guess it’s a similar experience when you sit down and attempt creative writing for the first time. You tend to use very lofty language, throw in every cliche under the sun and drown your story with too many adjectives that it becomes disjointed. It’s not natural or flowing and it’s very forced. My watercolour painting felt a bit the same, so I decided to push myself. As my drawing style is very loose and bold, I decided my to approach it the same way. A later attempt trying to create more contrast and character in more work. When I paint a scene it’s very instinctive and fast. I like to put the colour down first and keep it quite saturated, oh and I never pencil in – never. I try not to “paint” the scene in but rather capture the colours I see. For instance if the scene had a bed of flowers in the foreground and a gothic church in the background, I wouldn’t bother painting in little coloured dots for all the flowers shown, nor put in a lot of the architectural details of the church. I would either put in large blobs or one large brush stroke for the flowers and just block in the overall shape of the building. Once the colours are dry I put all the detail in with linework. If the linework doesn’t lineup with the colour washes it doesn’t bother me. It gives some movement to the picture, and those white spaces allows the picture to breathe, so to speak. What I have struggled with is to get the balance between the linework and colour. You know, the old chestnut of knowing when to stop. And it’s also about trying to create more spatial depth in my pictures – putting too much detail in the background can destroy that, as well as having the same line width used in both foreground and background. 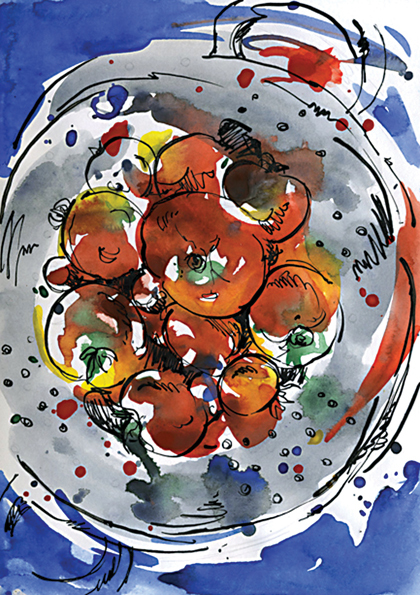 For more watercolour examples please click here. great read meegan!!!!!!!!! 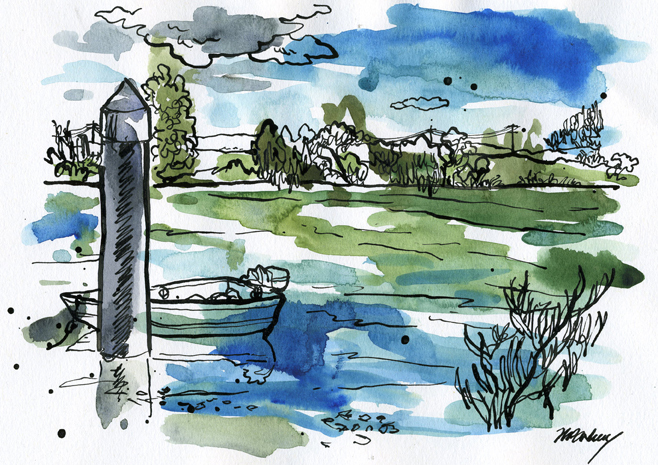 really really love reading your thoughts and I had no idea you did ‘traditional’ watercolour paintings as well! Thanks Liz. Yeah I find somethings are worth going down the more traditional route with. It’s quite therapeutic to labour over a painting sometimes and you do get a chance to study your subject matter a little closer. 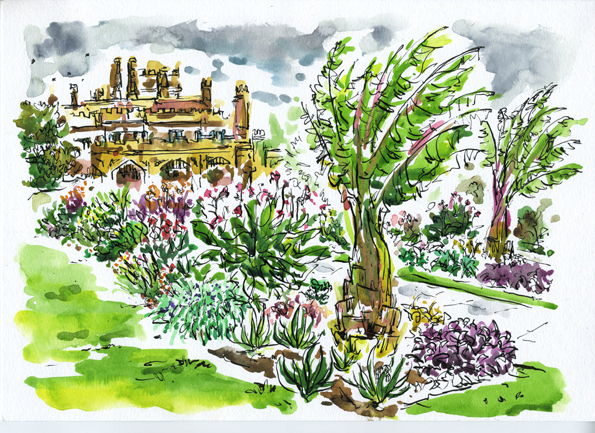 I have been acquainting myself with your sketching architecture blog. That’s my next challenge. I’ve been looking for insight into approaching drawing buildings that will work well with my own sensibilities.